function which is imperative for ideal absorption and utilization of nutrients. Ultimate™ Flora Fx™ also contains the prebiotic glucono delta lactone (GDL), a patented, naturally-occurring agent that nourishes the beneficial bacteria in the small intestine, helping to promote intestinal health. 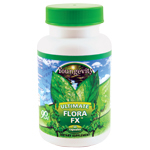 Ultimate™ Flora Fx™ also contains the prebiotic glucono delta lactone (GDL), a patented, naturally-occurring agent that nourishes the beneficial bacteria in the small intestine, helping to promote intestinal health.